Feedback from client to furthur develop design and navigation. Web site design entails many factors. Not only should your web site be attractive, it must also be user friendly and accessible. 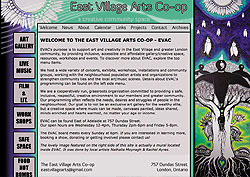 During part of my 2 years of schooling on Multi-Media Design and Production (website creation/delevopment, graphic design, video filming & editing, special effects, Flash animation) at Fanshawe College, I worked for a design/advertising company, producing web sites for corporations and business in South Western Ontario. I decided that it wasn't quite the job for me. Some of the companies we serviced had business practices, agendas and ethics (or lack of) that I didn't agree with or support. I wanted my creativity to be used to produce something positive for this world. So I began to make web sites on my own terms, for companies, organizations and businesses who share my love for art, music, people, animals, the environment and a happy, healthy world. I have now been working as a freelance web designer for the past 12 years and I am anticipating more amazing projects in the future. If anyone needs to design and maintain a web site contact me and perhaps we'll get the chance to produce something inspiring. 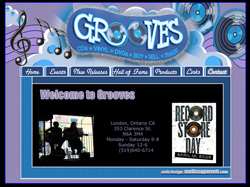 A brand web site design for local music store, Grooves. I used the store logo and colours as a starting point to create this funky animated theme. and check out the local music box! 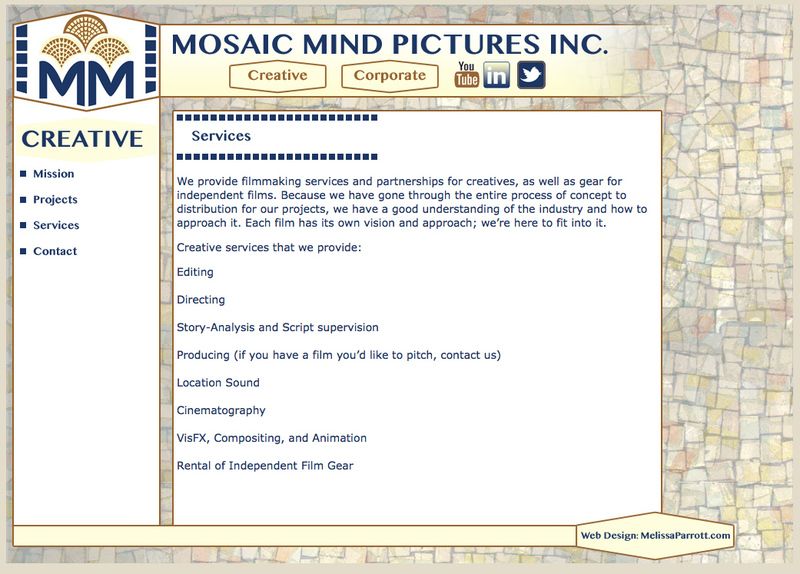 Creation of a site with multiple sections for loads of information and organization. Matched the design with other promotional materials. Graphic roll-overs enhance the visual appeal of this site. Elaine Wilson has always enjoyed painting as pasttime. She decided she would like a web site of her own to display her artwork. 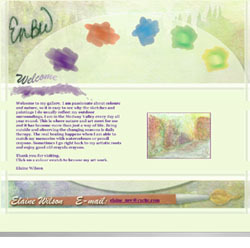 Using a watercolour theme I designed the pages and scanned in her artwork. Many of the pieces are paintings of the scenic Medway Valley in London. 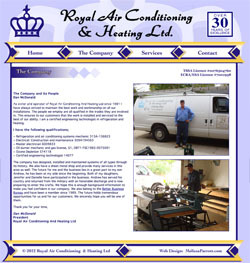 Royal Air Conditioning & Heating Ltd.
Royal Air Conditioning & Heating Ltd. is a local independent business that has been in operation for over 30 years. They have the experience, but what they really needed now was a web site, so I met with them in the Fall of 2012 to design and programme a brand new site. Welcome to the www! "Building for a Sustainable Future"
Interested in how to make your home energy efficient? Thinking of building a home with low energy costs and renewable alternatives? Find out more info on the site. 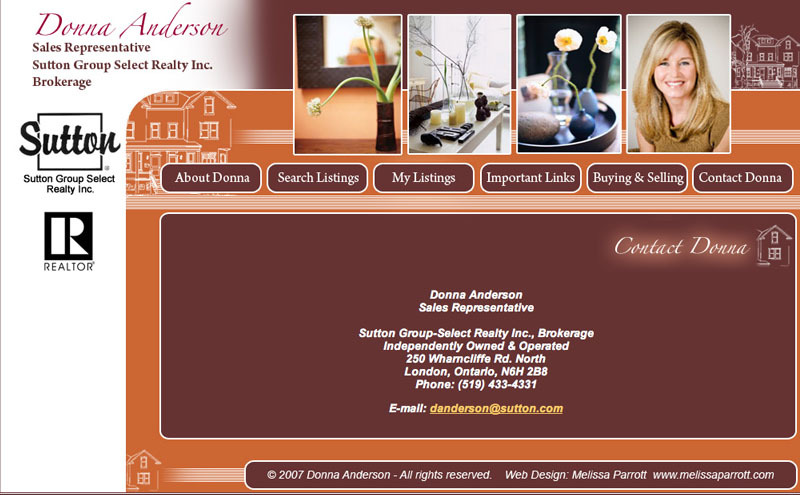 Donna wanted a new sophisticated look for her web site. This redesign includes a classy colour scheme and some existing photos. Content development and house theme. 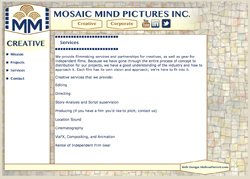 Mosaic Mind Pictures needed a double site, with 2 main sections; Creative and Corporate sides of the coin. 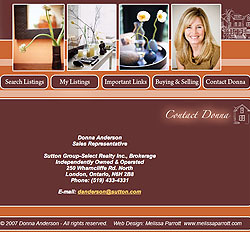 After designing the logo, I came up with a complimentary site design and custom layered a tile background graphic. The social media icons were also customized to match the site. Local Photographer Wes Robitaille needed a new look for his wedding photography business. A logo and website were created and the design was tweaked until the desired 'look' was achieved! 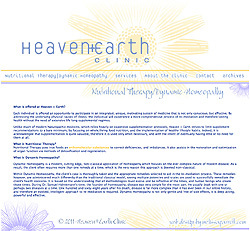 I've been recruited as a graphics person for Calgary based Heaven+Earth Clinic. Altering an existing logo, to provide a fresh, bright look for theit online presence. Along with a brand new website, I've redesigned their promotional material, business cards, letterhead, store sign, twitter page and more. 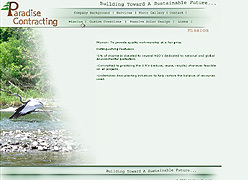 I've been inspired to create a source for information for sustainable living practices. Unfortunately, since it is a spare time project, and I have little of said time to spare, there is not much content. The design is completed and I am slowly adding information on housing, food, energy and transportation - and how we can make simple lifestyle changes to live with the earth instead of against it. Please let me know if you like the design and what you think should be included on the site. I could use some writers. Contact me if interested in participating. John C. Young is one of my oldest, long-standing clients. 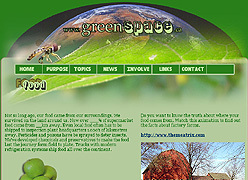 A new web site was designed in 2008 for John C Young Design Ltd. 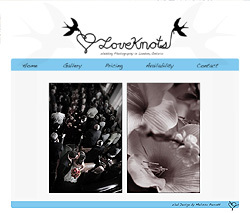 The site has been updated bi-annually. Local Artist and Author, Georgia wanted her creation to come to life. She requested the character she had painted be brought to life. 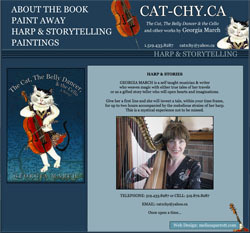 An animation of the cellist cat was produced, along with a web site showcasing her art and musical abilities. 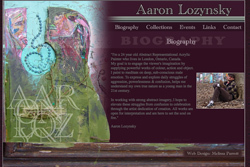 Local Artist and Musician, Aaron Lozynsky wanted to showcase his paintings on the web. This site was in use from 2009-2013 and featured a huge portion of his works in the 'Collections' Page. We collaborated again on this video promo I produced, depicting the benefits of signing up for Aaron's guitar lessons. once again, making this music video! 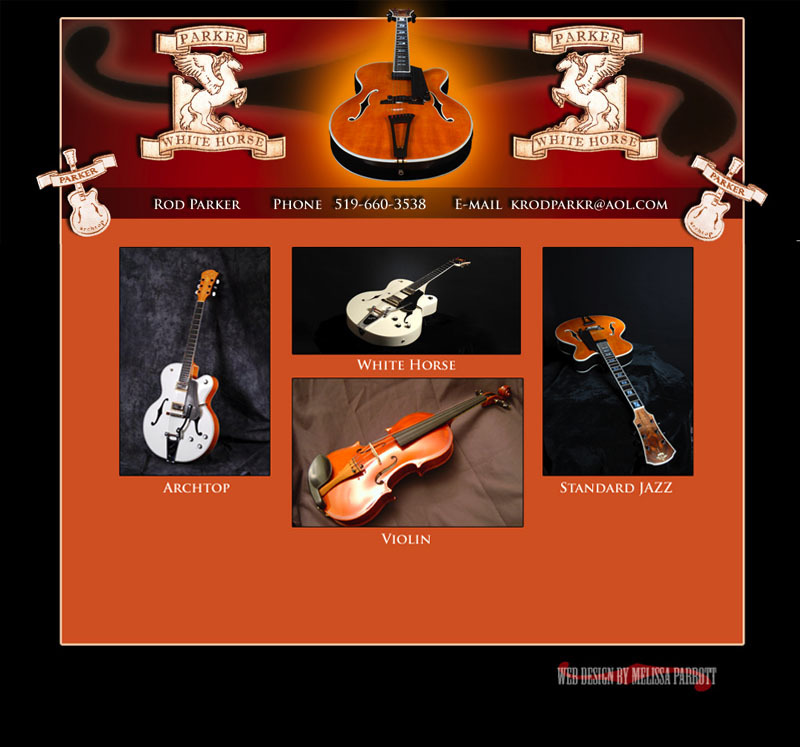 A brand new web site created for a local luthier, who creates beautiful guitars and violins by hand, with an attention to detail. Logo alteration and alternative logo design, web theme involving guitars, sunbursts and f-hole instrument features. 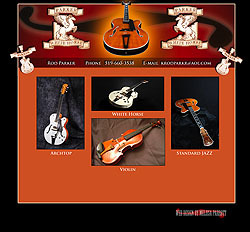 Custom layout and photography (violin). 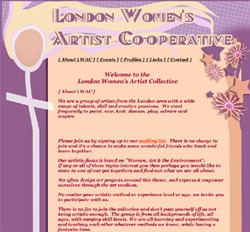 Founded in Spring of 2006 by a group of local women, LWAC has evolved into a collective of over 70 members. We have workshops, events, showcases and a lot of fun! I have created a web site and business card for LWAC, as well as taken on an key role in keeping the collective alive (administrative/organizational). Joining the collective is a free way to learn new skills and enhance the community while meeting new people with similar interests. 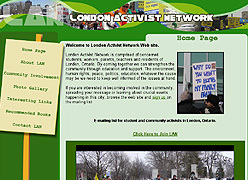 Another past project was to design a new web site for London Activist Network. 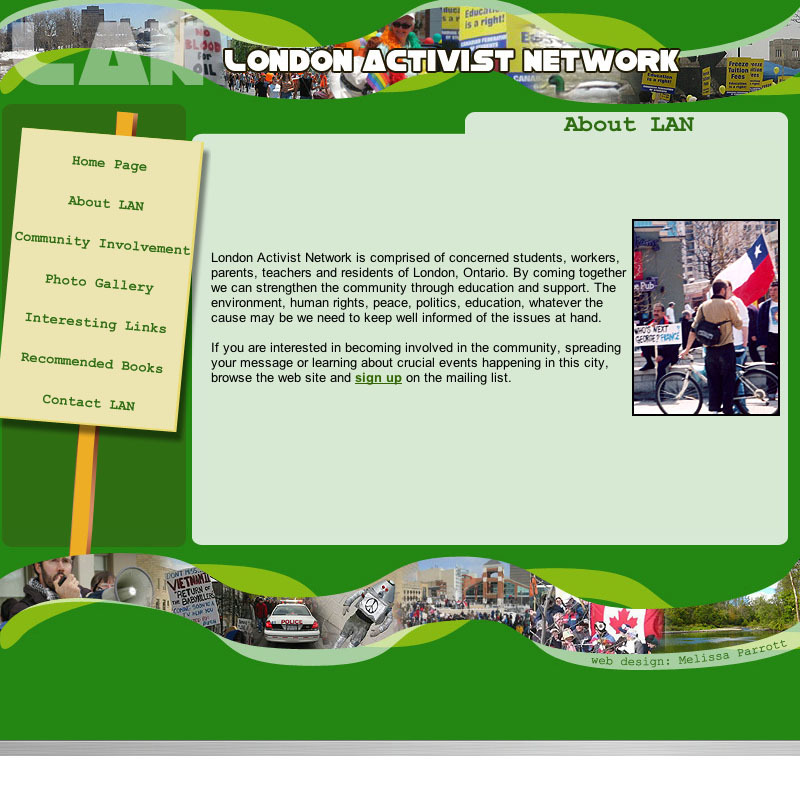 LAN brings together concerned Londoners to organize events and spread the word about important issues. Membership is free and the knowledge gained is priceless. Please send me your thoughts/comments about this design, as well as any links/recommended books you think may be appropriate. This web site was first created in 2003 and has been updated and maintained by me until 2010, when the business was sold. 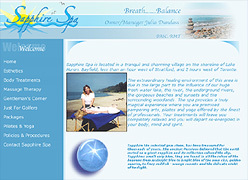 I worked with small business owner Julia, to create a site that had a relaxing tone and reflected the spa atmosphere on the beach. We worked together to develop a high quality logo that she was very pleased with and has incorporated onto items such as business cards, signs and clothing. I've teamed up with Toronto activist Chai Kavelar to redesign the existing Global Survival site of his. 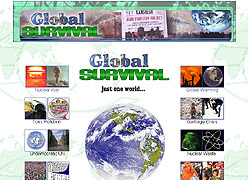 With a little design, new graphics, more of Chai's poems and some additional articles and links, Global Survival has become an excellent alternative media source. 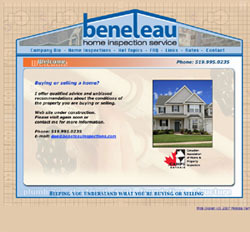 Beneteau Home Inspections. Web site and Logo design. based on ideas and colour scheme from existing print material. 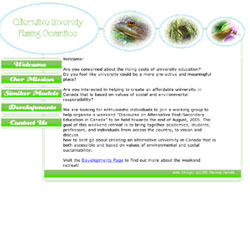 I found myself involved in an e-mail group created to facilitate the creation of a university focused on social justice and environmental awareness in Canada. I've designed a few pages to outline the mission. Definitely check it out if you're interested in affordable and valuable education. Any questions or comments about my web design?